Seeing as Halloween (Sam Hain, Winter Nights, call it what you will) is upon us, I feel that it is the perfect time to review a book that has been a standard of the Craft since its original publication in 1921. There are — honestly — dozens of reprints of The Witch Cult in Western Europe out there. The book has long since passed into public domain, every real publisher, every indie publisher and every would-be publisher can legally and freely reprint and distribute it, and in these days of Amazon.com and CreateSpace, everyone seems to be doing just that. So, should you, the reader, be interested in any one particular modern publisher’s particular reprint of this classic tome of Witchcraft? Yes, you should. The particular edition I am reviewing is published by the IAEGCA (initials for what is translated into English as the Portuguese Institute of Higher Studies in Geopolitics and Auxiliary Sciences), and designed by no other than Flávio Gonçalves (see chapter 5  of this reviewed book, and also this series ). This is a title in a longer series of titles, reprinted to further the exploration and exultation of (among other things) traditional European spiritual metaphysics. Every reprint that adds to our folkway is a positive one, every reprint that comes from a publisher who is part of our folkway is the best of these positives . . . and the one to choose when purchasing a copy. But, don’t let the fact that this publisher is worth supporting sway you—let the fact that this edition is worth owning do the sway. Because it is always the cover that people judge the book by, despite common wisdoms to the contrary, I will begin my real review (as opposed to my preamble) of this particular edition here. The cover fits the book—combining straight forward back-cover information and an easy to read American style (running from top to bottom) spine with a haunting woodsy/pentagram-embellished image on the front— all done in shades and tones of dark on light. Stark? Not at all. Striking? Absolutely. The text of the original is reprinted wholly, and there has been no attempt to sanitize or revise any of the content by editorials or notes inserted by the current publisher. Another feature of this edition, which is in keeping with the original, is that the extensive German, French, and archaic English testimonies and court records that Murray draws from as examples have not been translated: “les Sourciers neatmoins vont quelquefois de pied au sabbat . . .” or updated: “. . . they daunced together, and the ground under them wes all fyre flauchter.” The reader, then, does not have to trust that a translator has not (consciously or unconsciously) colored any of the meanings in any way. It can get a little inconvenient at times to have to puzzle out what is being stated (at least for this reviewer who has only a little German, and slightly more French—although I do have a knack for archaic English) but it is certainly not impossible—particularly with the overall context of most of the texts being narrowly focused, and the entire internet at our disposal to clarify anything that really bugs us. All in all, a very decent copy from an excellent publishing house—what more can one ask for on the practical side of things? Okay, then, on to the intellectual side! The Witch Cult in Western Europe is compelling reading — both from a historical point of view, and from a spiritual point of view. I am not a witch. I am a heathen — and, granted, for many readers of this review the distinction I make is hardly there, but for the rest of us, it is a wide enough gulf to be considered. So while I found some of the same sort of testimonials a little tedious — How many witches do we need tell us that the devil’s hand is “weire cold”? Quite a few, evidently, the evidence goes on for 3 pages — I never found any part of this book to be completely devoid of interest. Whether Murray’s extrapolated theories jell with accepted witchcraft lore is not in the scope of this reviewer. I will note, however, that this book seems to be always mentioned as “controversial” when it is mentioned in witchcraft circles at all. But I certainly found her theories plausible and her intentions to establish the fact of an indigenous European witchcraft religion laudable. As the early historical records of these islands were made by Christian ecclesiastics, allowance must be made for the religious bias of the writers, which caused them to make Christianity appear as the only religion existing at the time But thought the historical records are silent on the subject the laws and enactments of the different communities, whether lay or ecclesiastical, retain very definite evidence of the continuance of the ancient cults. I think that Murray was quite correct in her theory that ancient spirituality did not end with the dawn of European Christianity, and while I think that some of her included examples of witchcraft are distorted and/or imprecise (“Reginal Scot  says that the ointment ‘whereby they ride in the aire’ was made of the flesh of unbaptized children” — remember, when reading things like this, that nowadays we have flowers called ‘foxglove’ which contain no foxes and no gloves . . .) others are exactly right: (“We enjoin that every priest zealously promote Christianity and totally extinguish heathenism, and forbid well worshipings, and necromanicies and divinations, and enchantments, and man worshipings, and the vain practices which are carried on with various spells and with ‘frithsplots’, and with elders, and also with various other trees, and with stones, and with many various delusions, with which men do much of what they should not.—And we enjoin, that every Christian man zealously accusation his children to Christiainity, and then them the Paternoster and the Creed. And we enjoin, that on feast days heathen songs and devil’s games be abstained from”). Pagan Europe did survive. The book is arranged in an eminently civilized manner: main chapters being devoted to origins, ceremonies, rites, assemblies, organizations, and familiars, with subsections within discussing matters such as the appearance of Satan (what he wore: “clad in a black tatie gown, and an evil-favoured scull bonnet on his head” as well as what animal guise he took: “. . . he went before us in the likeness of a rough tanny-Dog, playing on a pair of Pipes, and his tail played ey wig wag wig wag”. . .), the vows made (“. . . renoncer & renier son Createur . . .’), the feasts laid on (“The divill and the witches did drinke together having flesh, bread and aile”), the dances performed (“The ring dances were usually round some object, sometimes a stone, sometimes the Devil stood or was enthroned in the middle”) and even the offices held by leaders of the religion which Murray calls the witch cult: (“The Chief or supreme Head of each district was known to the recorders as the ‘Devil’. Below him in each district, one or more officers –according to the size of the district — were appointed by the chief. The officers might be either men or women . . .”). It is as fascinating as it is compelling. The lists of witch-names bring to light several facts as regards the women. One of these is the entire absence of Saxon names, such as Gertrude, Edith, Hilda; Old Testament names are so few in number as to be negligible, Scandinavian names are not found; the essentially Puritan names, such as Temperance, hardly occur, but the great mass of names fall under eight heads with their dialectical differences: 1, Ann (Annis, Agnes, Annabel); 2, Alice (Alison); 3, Christian (Christen, Cirstine); 4, Elizabeth (Elspet, Isobel, Bessie); 5, Ellen (Elinor, Helen); 6, Joan (Jane, Janet, Jonet); 7, Margaret (Margot, Meg, Marjorie); 8, Marion (Mary). Almost concluding the appendices, and also the book, is a wonderful, if dated (but, really, do books of this nature go out of date?) bibliography listing materials from 1597 (James’ Demonologie) to 1914 (John Hale: A Modest Inquiry). Like I said earlier, this book is as fascinating as it is compelling. For Christians, I’d say, it is very good to read this book if only to know that not everything heathens and pagans say is a modern fabrication designed to undermine Christianity, as the records quoted in the book are authentic ones — recorded by Christians of the time, with no consideration at all for what 21st-century pagans might make of them. And there is a lot of be made of them. 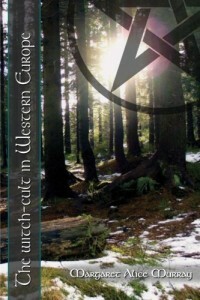 For Heathens, I’d add, it is important to read books of this nature, and this book in particular is a reminder that the heathen path did not develop in a vacuum and that it did not begin in a Viking Longhouse either, underlining the fact that modern heathenry comes from a long line of indigenous European spiritual folk and that heathenism belongs to the European people as firmly and as fixedly as the European people belong to this earth. The Witch Cult in Western Europe is — if you are anything like I am — one of those rare sorts of books that you pick up to satisfy one intellectual facet (I knew nothing about early witchcraft and thought it would be interesting to read about) but you find, suddenly, that you are satisfying another facet altogether (for me the notion of “witchcraft within what is perceived as normal society” aspect is riveting). This is, of course, the unmistakable sign of a great work — as this book surely was, is and shall continue to be throughout its many editions and publishers — there is something within it that can be of interest to everyone. 2. I said that, not the publisher. 3. There is a strange seven name listing from 1324 (the earliest record) of accused Irish witches at the actual conclusion of this book.